Aphria, Inc. (NYSE: APHA) produces and sells medical cannabis in Canada and internationally. The company offers sativa, indica, and hybrid medical marijuana products, as well as cannabis oils. It serves patients and health professionals. The company also sells its products online. Aphria Inc. is headquartered in Leamington, Canada. On April 5th the company announced that its German subsidiary Aphria Deutschland GmbH (“Aphria Germany”) has been selected by the German Federal Institute for Drugs and Medical Devices (“BfArM”) to receive a license for the domestic cultivation of medical cannabis. The company also launched its first CBD-based nutraceutical product on the German market. The product, part of the CannRelief brand, uses hemp-derived CBD and is produced in the European Union. The first CannRelief product is distributed by Aphria’s subsidiary CC Pharma, which the company acquired earlier this year, and has access to more than 13,000 pharmacies throughout Germany. CannRelief CBD oils are available with a 5-percent and 10-percent CBD concentrations in select stores across Germany. Throughout 2019, the company will continue introducing CannRelief skincare and products, including creams, serums and masks. 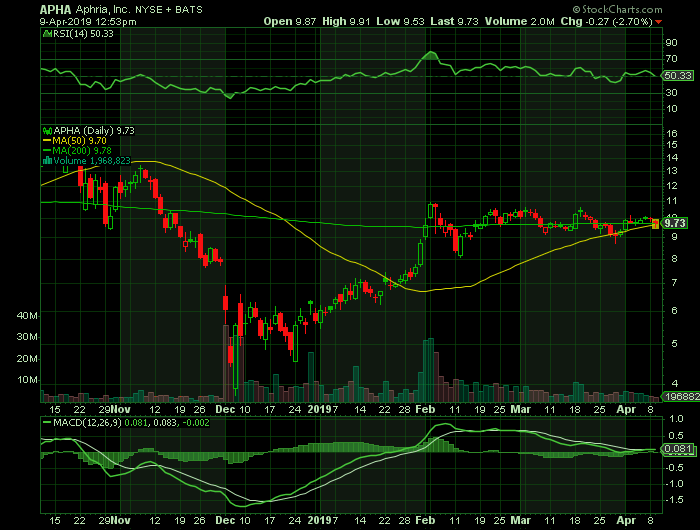 At $9.73, APHA shares are trading above their 50 DMA of $9.70 and below their 200 DMA of $9.78.